In 1780, France sent troops under the command of the comte de Rochambeau to help General George Washington and the Continental Army fight the British. They arrived off Newport, Rhode Island, that July, and in September, Rochambeau met with Washington in Hartford to plan their strategy. Moving large numbers of troops and materiel over long distances requires careful planning—and accurate maps. The French army of the mid-18th century had a large body of cartographic material available and a corps of officers trained in drawing road and other maps. When Rochambeau arrived in Newport, his staff included some of these skilled draftsmen. In October, the two best-known French topographers, Louis-Alexandre Berthier and his younger brother Charles Louis Berthier, arrived in Newport. The skills of the Berthier brothers and their colleagues were sorely needed in the New World. 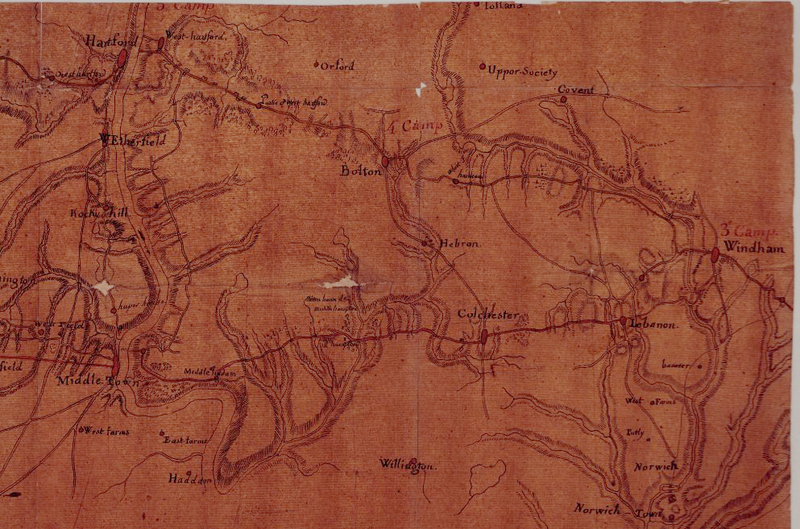 Before other French “volunteers” (so labeled because France was not yet officially involved in the war), such as military engineer Louis Le Begne de Presle Duportail, arrived in the spring of 1777, the Continental Army had no trained topographers or much of a map archive. Most of the military maps were in British hands. Six weeks later, on June 11, Rochambeau’s forces sailed from Newport to Providence and on June 18, the first regiment set out on foot for White Plains. The remaining three regiments, totaling nearly 3,000 troops, followed in daily intervals. 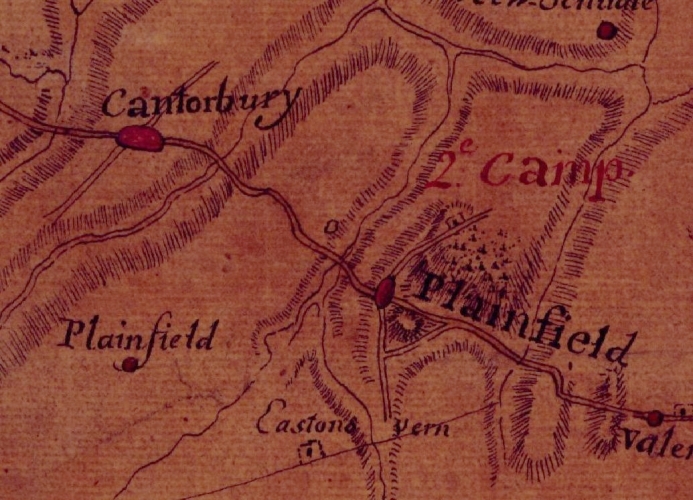 On the morning of June 19, they crossed into Connecticut and encamped in Plainfield. 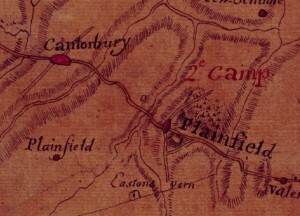 There had been no time to execute full, detailed maps, only road descriptions and sketches indicating the locations of campsites. Berthier and another unknown draftsman kept their sketches and took them back to France in 1783. Here they became the basis for road and camp atlases chronicling the movement of French forces through Connecticut and along the East Coast. Most of these sketches seem to already have been discarded in America and after the completion of the atlases in France, the remaining sketches were discarded as well. Only a single field sketch, drawn by Berthier of the camp in Farmington on their return in late October 1782, has survived. These maps, now part of the Berthier Collection at Princeton University and the Rochambeau Map Collection at the Library of Congress, are beautiful works of art. In many cases, they also constitute the earliest detailed and extremely accurate maps of small geographic areas such as campsites. A comparison with modern maps confirms the location of many of the churches and taverns they identify. Many of the roads taken by Rochambeau’s forces have become modern roads clearly discernible today; others, long since abandoned, still exist in small segments off the beaten path. Bob Selig, the project historian to the National Park Service for the Washington-Rochambeau Revolutionary Route National Historic Trail project, holds a PhD in History from the Universität Würzburg in Germany. © Connecticut Explored. All rights reserved. This article originally appeared in Connecticut Explored (formerly Hog River Journal) Vol. 10/ No. 2, SPRING 2012. “George Washington and Jean B. Donatien de Vimeur, Comte de Rochambeau, September 22, 1780, Hartford, Connecticut, Conference - George Washington Papers at the Library of Congress, 1741-1799,” 1780. Library of Congress, American Memory. Link. “Guide to the Rochambeau Papers and Rochambeau Family Cartographic Archive.” Yale University, Beinecke Rare Book & Manuscript Library, 2016. Link. “MAGIC Historical Map Collection - Connecticut Towns.” University of Connecticut, 2012. Link. “Marche De L’armée Française De Providence À La Rivière Du Nord.” 1781. University of Connecticut Libraries, Map and Geographic Information Center - MAGIC. Link.